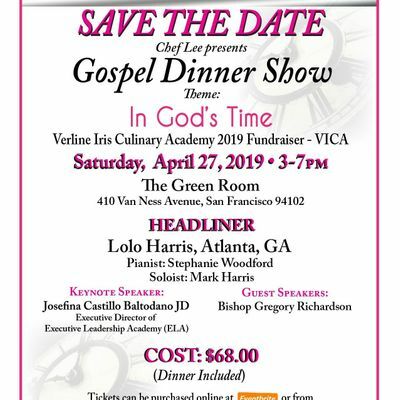 Chef Lee Presents: Gospel Dinner Show "In God's Time "
The Academy is an all year round after school program that teaches inner-city kids basic life skills that prepare them on how to become great Chef's. This year we are raising 100k toward opening the Academy this spring 2019. 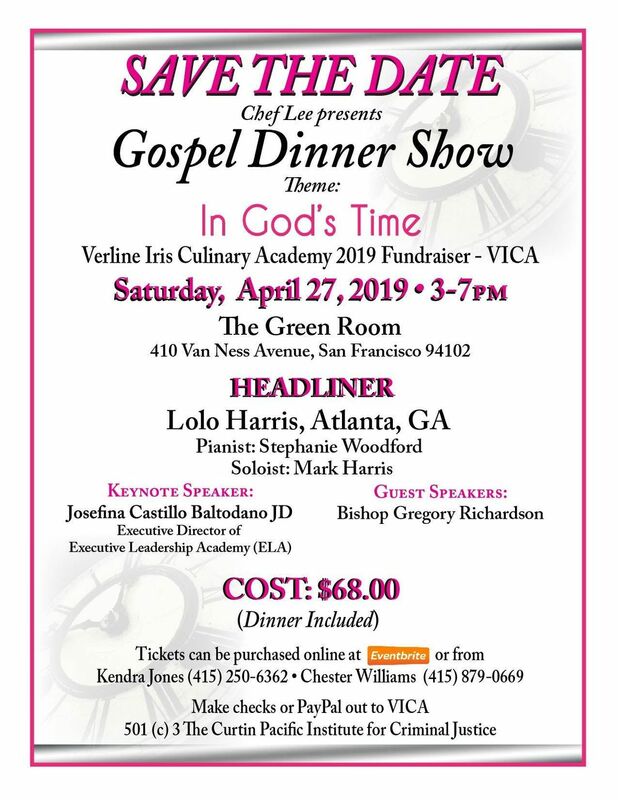 We are currently fundraising for our Annual “Gospel Dinner Show” which will be held on April 27, 2019 held at the The Green Room 301 Van Ness Avenue, San Francisco, CA 94102 from 3 pm -7pm, which proceeds will also be contributed to the Verline Iris Culinary Academy. In support, I am asking for your tax-deductible donations in the amount $68.00 - $5,000 to make the Fundraiser a success. Your donation will go towards the Academy and to the kids that love to cook. All donations can be made payable to through PayPal or out to Verline Iris Culinary Academy (VICA) 959 Buchanan Street Ste. E, San Francisco, CA 94102, 501(c) The Curtin Pacific Institute for Criminal Justice, or through our Go Fund Me Page on Facebook. Thank you for your support.